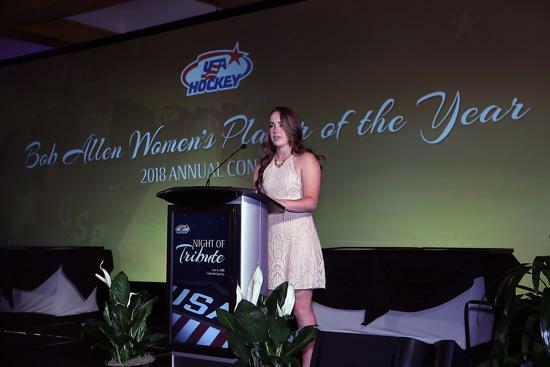 COLORADO SPRINGS, Colo. — Maddie Rooney (Andover, Minn.) was honored tonight (Oct. 17) as the 2018 Team Sportswoman of the Year by the Women's Sports Foundation at the 39th Annual Salute to Women in Sports Gala at Cipriani Wall Street in New York City. The Team Sportswoman of the Year award is given to an athlete who participates on a team and exhibits exceptional performance over a 12-month time span. 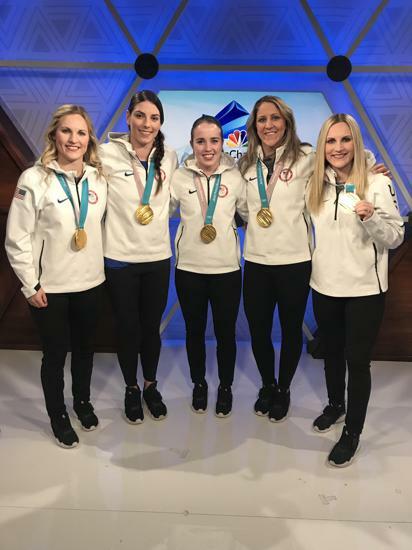 The 2017-18 season was especially sweet for Maddie Rooney, who backstopped the U.S. Olympic Women’s Ice Hockey Team to a gold medal at the 2018 Olympic Winter Games and a first-place finish at the 2017 Four Nations Cup. 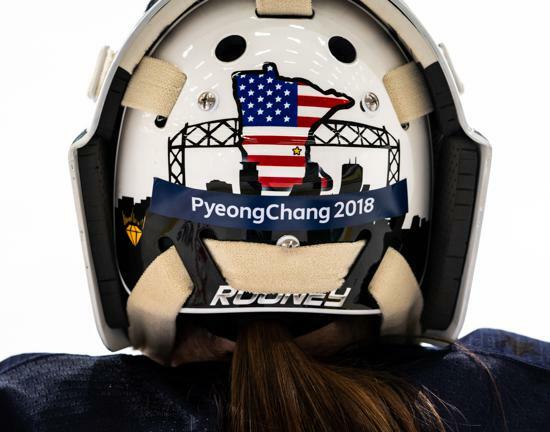 During the Olympic Winter Games in PyeongChang, South Korea, the 20-year-old posted a stingy 1.16 goals-against average to lead all tournament goaltenders and a .945 save percentage that ranked second. 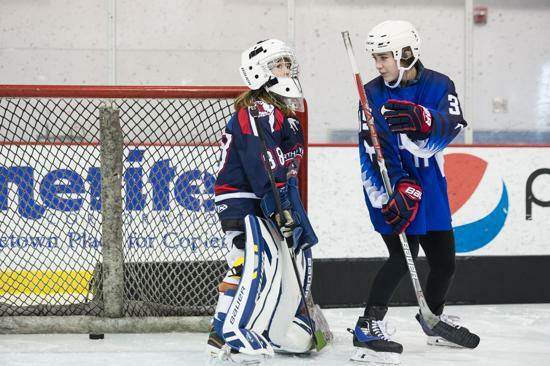 She played in four of the five U.S. games, recording 260 minutes of ice time and allowing only five goals. 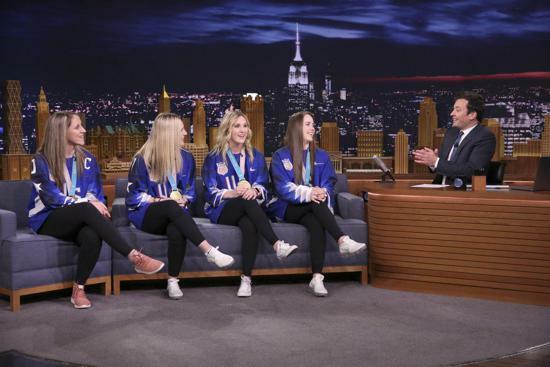 Saving her best for last, Rooney blanked Finland in the semifinals, 5-0, stopping all 14 shots, and then stymied Canada in a captivating overtime shootout to help Team USA earn its second Olympic gold medal in women’s ice hockey. 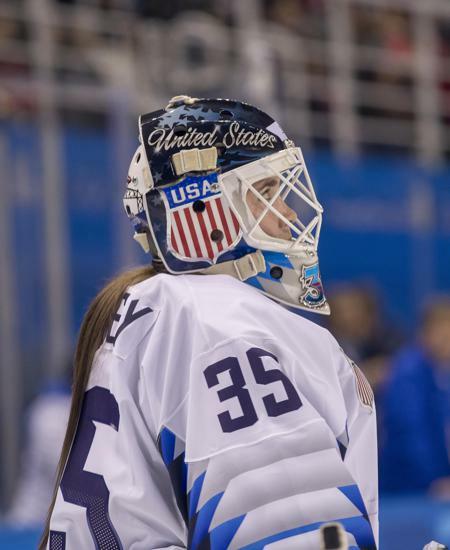 At the 2017 Four Nations Cup in Wesley Chapel and Tampa, Florida, Rooney recorded 49 saves and a .907 save percentage, notching three wins in three games, including the championship game against Canada. 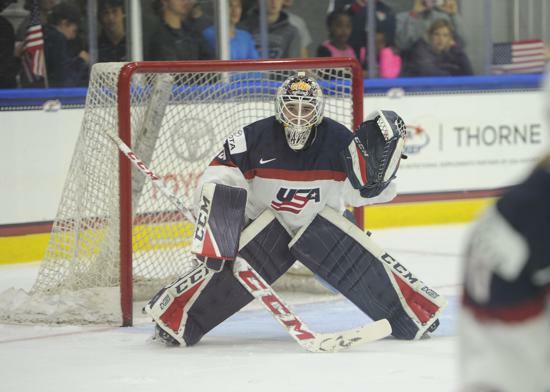 Rooney also stopped 23 of 25 shots in a 5-2 victory against Canada in an Olympic preparation game in Quebec City on Oct. 22, 2017. NOTES: The U.S. Women's National Team was honored with the 2017 Wilma Rudolph Courage Award during the Annual Salute to Women in Sports held last year on Oct. 18, 2017.Two-time Olympic silver medal-winning goaltender Jessie Vetter was also honored as Team Sportswoman of the Year in 2008... Finalists for the 2018 Team Sportswoman of the Year award were selected based on a total score collected by the public and the Women's Sports Foundation Awards Committee. Rooney joins an esteemed list of past winners that includes Vetter, as well as, Maya Moore, Candace Parker, Ashleigh Johnson, Carli Lloyd, Abby Wambach, Serena and Venus Williams, Jessica Mendoza and Mia Hamm.